The term “Victorian” refers to the age of Queen Victoria’s reign from 1837 to 1901, not to a specific style of architecture or interior design. The era was a time of empire building and rapid industrialization led by Britain, Europe and the United States. Technological advances allowed a new range of vibrant colors for fabrics, paints, and wallpapers, and made the Victorian Era an age of color and ornament. History was seen as a treasure chest where designers could take inspiration from every period from ancient Egypt, China and Turkey to the Middle Ages and 18th century France. Moral and social reformers of Victorian times influenced art and architecture. In the 1830s and 1840s, Gothic style cottages were fitting houses for Christian ladies and gentlemen. Architectural writers such as Andrew Jackson Downing popularized Italianate houses, which were inspired by the fortified and towered farmhouses of northern Italy. By the 1860s, the glamour of France had captivated America, especially Newport, and the Second Empire-style house became fashionable for American buildings. A textbook example of Victorian design, Chateau-sur-Mer (1852) began as an Italianate style house built for the retired China Trade merchant William Shepard Wetmore. The simple, rough-hewn granite walls, the heavy brackets supporting the roofline, and the dominant central tower are typical design features of the Italianate villa. William’s son, George Peabody Wetmore (U.S. Senator from Rhode Island 1894-1913) inherited Chateau-sur-Mer in 1862 and engaged architect Richard Morris Hunt to remodel the house on two occasions, first from 1870-1873, and then again from 1876-1880. As the first American to attend the École des Beaux Arts (School of Fine Arts) in Paris, Hunt brought the latest in French taste to the Wetmore project. He transformed Chateau-sur-Mer into a palatial Second Empire French chateau with a new steeply pitched Mansard roof, typical of those found in Paris in the 1870s, and ornate details such as molded cornices and copper cresting. 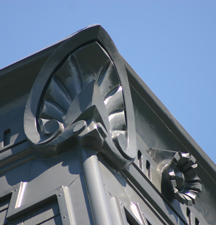 Honeysuckle “acroterion,” originally an element found in Greek temples, ornament the peak of rooflines. 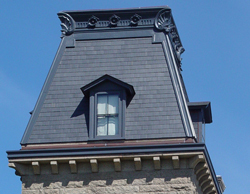 A Mansard roof is a type of high-pitched roof, developed in 17th century France by architect François Mansart, revived in Paris in the 1850s during Emperor Napoleon III’s remodeling of the city. 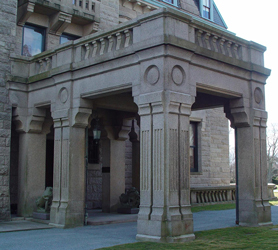 The port-cochère, or carriage porch, was designed in the Neo-Grec style with square fluted columns topped by round discs reminiscent of ancient Egyptian temple architecture. Neo-Grec decoration, a combination of ancient Egyptian Greek and Roman motifs, was popular in Paris in the 1840s before spreading to the rest of Europe and America.